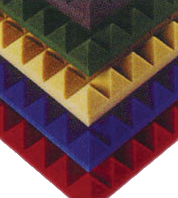 Open cell polyurethane acoustical foam. Polyurethane foam is flammable and may emit toxic fumes when burned. Do NOT use near open flame. Check local codes for allowed uses. Manufacturer assumes no liability.